Thought provoking page turnerQuirky humorous read examining the death of God and religion. I may read this again to figure out any deeper meanings. "Ten years after the death of his fiancee, and ten years before the Immortals walked out of the sea, Sam Rogers discovered a hole beneath his sofa. "I immediately wanted to know more about Sam and the things that happened in his life that led up to finding the hole--and Gammarino did not disappoint. I was fascinated by his ability to incorporate so many different and thought-provoking ideas so seamlessly into one story. There was something about his style that made the story so accessible and so easy to read, though I have the feeling that no matter how many times I reread JellyFish Dreams, I will take something different away from it every time.The range of thought and human emotion Gammarino was able to portray was impressive; one minute I was deeply saddened and the next I was laughing hysterically. It was honestly unlike anything I have ever read.This novella is worth the read, AND multiple rereads. Tom Gammarino is a gem. The man knows his way around a sentence, and he makes six times his share of really good ones. He is inventive, funny, heart-breaking, quirky, astute, erudite, and the dude can tell a story, and never the one you expect to hear. It is rare that a writer can command my attention so thoroughly that I lose track of time and other appointments, but this book absorbed me completely, and I'm still apologizing. If you like writing that really is fresh instead of simply labeled fresh, if your imagination is still open for business, if really do like surprises instead of just claiming that so that someone will throw you a party, then read this book. I recommend it unreservedly. If you've ever had a dream where you've cut the skull off your dead fiancee to see if you can Frankenstein her back to life by MacGuyvering a toaster with a fish tank and occasionally masturbating onto her corpse ... finally, only at the bitter end using the escape hatch under the couch symbolizing the act of surrendering to God and hopefully meeting her in the afterlife while it turns out you should have just. used. the flesh. of the zombie jellyfish monsters knocking down your door to actually save her ... then yeah, this book is for you. Or, if you are an atheistic Ann Rand/Nietzche obsessed grad-school student thinking about going into a permanent life of Academia and you wonder what your dreams will be like if you ever lose the love of your life to cancer, that will work too. https://thebookloversboudoir.wordpres...This is my first time reading the author.I had a lot of fun with Jellyfish Dreams. I loved the premise, weird as hell but intriguing. I wanted to see where the story would lead and I wasn’t disappointed. I liked the way the author blended the current weird events with Sam’s tragic loss ten years ago and how this shaped his life.Jellyfish Dreams reminded me a lot of the books of John Wyndham. 3 1/2 stars. Funny, sad, deep, sometimes crazy. A writer to follow. 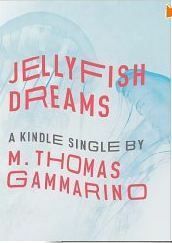 Dean Goranites of the BookReviewersClub reviewed the book “Jellyfish Dreams” by M. Thomas Gammarino. This story revolves around a character named Sam, who is an atheist and a type of biologist. The story starts very much like a “Twilight Zone” in that Sam is reading a book on his couch when he drops a bookmark on the floor. He reaches down to find the bookmark, but it’s gone. Instead, he finds a black hole under his couch, and anything he throws down there disappears. Anytime he shines a light into the hole, there is no reflection… there is nothing. Sam has no idea where this hole came from and no idea where it goes to, so he brings in a lot of experts and scientists to study it. The story continues on into a very bizarre love story. Sam ends up reflecting on his past and remembering his girlfriend from college. He remembers how they fell in love at a very young age, how beautiful she was, and all the different reasons he loved her, even after she passed away from cancer. Dean believed this story might be very close to the author’s heart and that he may have lived in a very similar situation. Dean felt that the interesting part of this story was – at first – the craziness surrounding the black hole. Later, it was a series of other strange events. But all in all, he felt it was very much like an episode of “Twilight Zone.” 75% to 80% consisted of cool stuff with some weird and mysterious happenings going on. Dean went on to say that this is all “real science fiction.” He felt it was a very exciting page-turner that suddenly turned out to be literary fiction. He felt it was definitely worth reading and he gave the book 4 stars because he felt he would probably read it again sometime in the future. Very interestingThis story was an interesting blend of science fiction and theology. If you can get through the big science jargon in some spots, it is worth the read. The story starts out with this guy named Sam who looses his book mark under the couch. When he moves the couch he finds this mystery black hole. The book goes on to describe the history and importance this book mark has on Sam's life.Then it goes to the present with the black hole under the couch and the immortal jellyfish. Believe me it is tied together. Also, don't forget to read the authors note. It is important to the story. This is a book that takes you in directions that you don't always expect and does so in the presence of some beautiful writing, always tinged with wry humor. The main character, Sam Rogers a former theology student, becomes an atheist biologist working on immortality after the death of his fiance. The story starts when Sam wakes up one day to find a strange hole under his sofa. So begins a tale starring science, religion, morality and unanswered questions all wrapped up in zany humor. This is a strange story, where things are not always as they seem, but stick with it to the end and you will be rewarded. There's not much I can say about Jellyfish Dreams that hasn't been said by the other 5-star reviewers. It's strange, unexpected, funny, thought-provoking, and sad. The characters are immediately relatable. It's got what might be one of my favorite endings ever. Read it! Amazing! Lately, I haven't been surprised by any plots, but this book was witty, suspenseful, and full of unexpected developments. Can't wait to read more by Gammarino. M. Thomas Gammarino - M. Thomas Gammarino is the author of the novels King of the Worlds (Chin Music Press, 2016) and Big in Japan: A (Hungry) Ghost Story (Chin Music Press, 2009), and the novella Jellyfish Dreams ( Kindle Single, 2012). In 2013 he received Hawai’i’s highest literary honor, the Elliot Cades Award for Literature. He lives in Honolulu with his wife and kids.